You are as much a creation of the same Creator who created the wind, the ocean, the Earth and the Sun. The Sun rises sans any fear all by itself. The oceans and the rivers flow, knowing it is their job. The wind blows without any hard endeavor, not waiting for any orders. What are you waiting, what is the reason of procrastination and what is stopping you from being blissful or from being yourself? It is all around you. Just need to feel it carefully and intently. Nature is playing its role by peacefully working on its goal. All the elements of nature are working out their destinies, each to its own. The wind blows without much strenuous efforts, blaming neither the sun for heating it nor the clouds for chilling it. It distinguishes between nothing; neither fair nor foul. It just keeps flowing without much botheration. The Sun rises every day, fully aware it has to set and yet it rises, with no apprehension and second thought in mind why it must rise. Nothing can waiver its action as it has decided to do so. There’s no fear of any sort, no compulsion, and no sense of duty anywhere in nature. It’s only human being who is stuck, lost and cut off from the touch of reality. He is little cognizance of his potential and available resources, thus is caught in the web of complaints and illogical cribbing. Man alone is obsessed with the other materialistic pursuits. He just comprehends and visualizes himself from the eyes of others. Just take a leap to unleash your unlimited horizons of hidden powers layered within you. Fight it with a smile. Stamp it on your file. Emboss it on a tile. Just walk an extra mile. NSS Wing and Sports Division of GNA University organized Yoga activities at its campus. 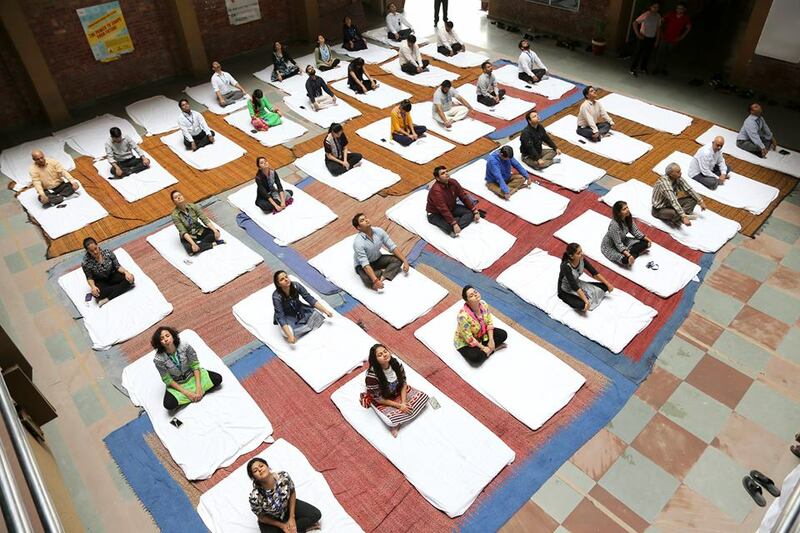 Around 100 GNA’S NSS Volunteers and faculty participated in the yoga activities. The event was organized in collaboration with Bhartiya Yog ansthan. Sh. Haridev, Sr Member, said that one should regularly perform ‘asanas’ to get spiritual and medical benefits out of these. He also stressed that yoga postures and exercises are very important for all of us in this hectic world to reduce stress. Dr Prem Kumar, Vice-Chancellor, Sh. Anil Kochar, Sh Jagya Dutt, Yoga Trainers, Bhartiya Yog Sansthan were also present.